The Mercedes E-Class Estate has claimed victory at the What Car? 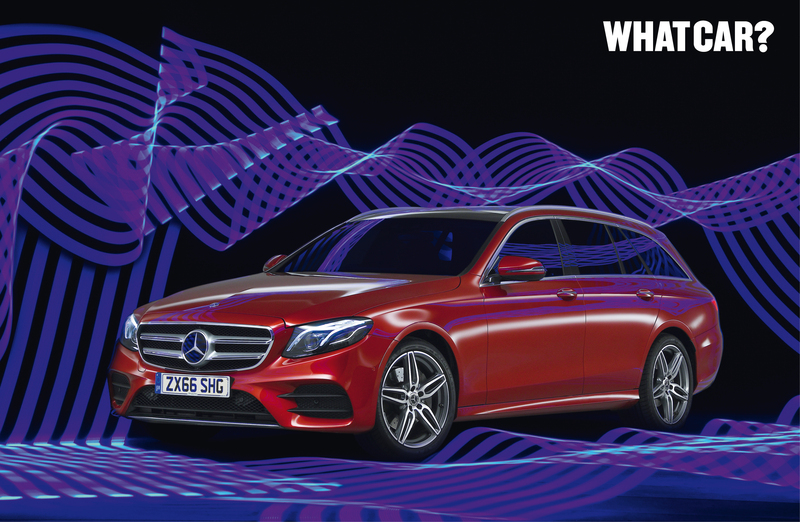 Used Car of the Year Awards 2019, triumphing over a host of the UK’s leading models. Mercedes proved its worth again in the Used Luxury Car of the Year category, with the S-Class coming ahead of the Porsche Panamera and BMW 5 Series. Audi repeated its success from the 2018 awards, leading the way in three categories with the Audi A3, Audi Q7 and Audi TT winning the Used Family Car of the Year, Used Luxury SUV of the Year and Used Coupé of the Year respectively. Audi’s victory in the Best Used Coupé and Used Luxury SUV sees the Q7 and TT taking their category top spots for the second consecutive year. “It's a master of all trades in its own right, in other words, but what really gives the E-Class the overall win here is that it combines this all-round excellence with terrific value on the used market. What Car? is committed to providing the very best used car advice that British motoring journalism has to offer and to covering used cars just as thoroughly as new cars. What Car?’s used car section includes reviews, long-term tests, group tests, classifieds, online valuations and a finance calculator to help buyers in the used market find the very best car for their needs and budget. The Used Car Awards are a reflection of the vast and varied used car market, covering nearly new cars as well as older models that might have more relevance to buyers on a budget. What Car? modelled its Used Car Awards on its long-standing Car of the Year Awards for new cars, which are widely acknowledged to be the most prestigious in the industry. In addition to holding special awards for the best used car website and best approved used car scheme, judging took place across 15 different classes of car, from city cars to luxury SUVs, via estates, coupes, green cars, and others. 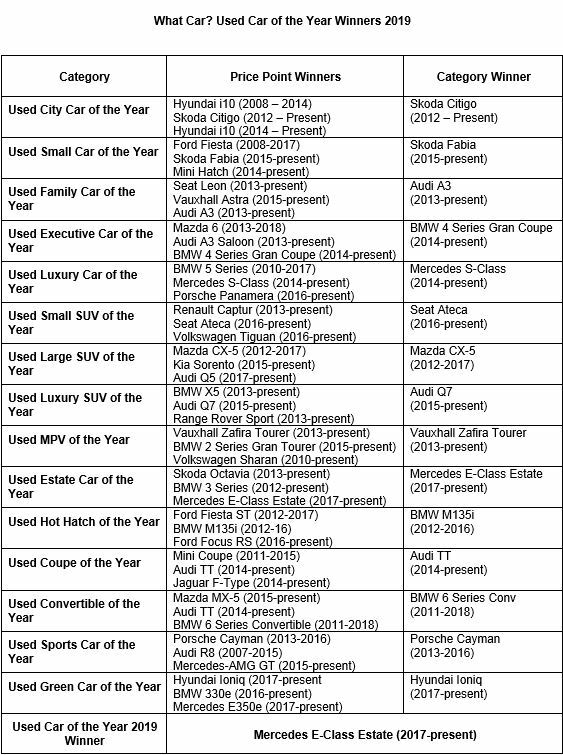 What Car?’s Used Car of the Year award winners were categorised by three different price points in each class of car. This allowed the judges to work out which models really were the best value used buys – and which looked too expensive, given what they actually offered to the buyer. Some cars fit into more than one price band, of course, with some appearing across two, or perhaps even all three, of them. In these instances, the What Car? judges selected the price group in which they felt the car was best served; either one in which it offered the best range of engines, benefitted from a facelift which brought new technology or extra equipment, or simply seemed like the best value of all. Cars aged five years or under were eligible for the awards. Using this methodology, What Car? was able to order the vast array of prices and models available and could then judge each car on its own merits, as well as by comparison with its rivals. Once victors in each price band within a particular class were chosen, the three finalists were pitted against each other for the overall category award. The judgement was made as to which of the three cars then offered the best overall value taking into account their age, likely mileages and condition and availability, and whether the pricier cars were worth the extra cost for any extra technology and advances they offered – or whether the lower priced cars were good enough to overcome the fact that they might not be at the cutting edge. The decision-making process took two days, during which the latest used values were ascertained from classifieds, and decisions drawn from What Car? 's extensive road testing experience. The expert panel debated the relative merits of hundreds of different models in order to work out which was the best in each class. In judging used cars, What Car? examined the quality of cars available for a certain cost; as used cars are limited in number, rather than available to order, a car's ubiquity was also factored in. If there are more examples around, the chances of finding a good one locally are greater, so ubiquity is a positive characteristic in a used car. What Car? also examined the availability of good examples of a specific model. If there were vast numbers of a particular car around at a good price, but they were all undesirable high-mileage, low-spec models, What Car? looked at the cost of more appealing versions. These picks of the range will have comprehensive specifications with an average mileage for the year and a full service history. If a car was still competitively priced on this basis, only then was it deemed to be good value. Natasha Perry, Sarah Wright, Andy Bothwell or Sam Wilkinson at Performance Communications on 0208 541 3434. This press release was distributed by ResponseSource Press Release Wire on behalf of Performance Communications in the following categories: Motoring, Personal Finance, Business & Finance, for more information visit https://pressreleasewire.responsesource.com/about.